Educational Electronics Equipment 1967-68 presents a critical review of electronic and electronic-based equipment designed precisely for educational and instructional purposes. It discusses the equipment for instruction and training in physics, electronics, and computer control. It addresses the nature of electronic aids use in technical establishments. 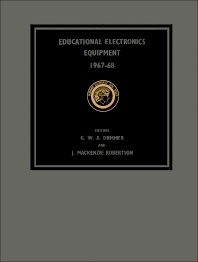 Some of the topics covered in the book are the description of lecture demonstration equipment; components of Model 70 digital computer trainer; advantages of low-cost teaching computer; uses of educational analogue computer; description of universal laboratory machine; parts of protective systems dynamic simulator; and content of machine demonstration kit. The mechanisms of operator training equipment are fully covered. Type MS 150 modular servo system and DC-8 engine trainer are discussed. An in-depth observation made on the control circuit for a stepping motor is given. A study of the functions of semi-automatic flight inspection simulator is also presented. A chapter is devoted to the Atlas missile airborne propellant feed and pressurization system trainer. Another section focuses on the mechanisms of Boeing 707 cockpit familiarization trainer. The book can provide useful information to teachers, trainer, students, and researchers.